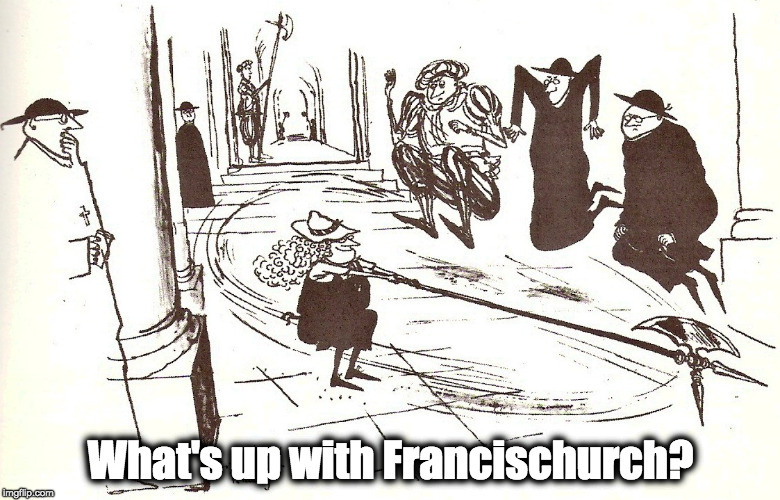 6.2 – What's Up With Francis-Church? It was the noise. I’ve never in my life heard such a horrifying noise. It was so loud, I thought for a moment that my worst child-of-the-Cold War nightmares had come true, but then I realized there had been no flash. It took me another second – while this appalling roar was still getting louder – to realize it was an earthquake, and probably a really big one. I curled up into a ball with my arms over my head and prayed the roof didn’t collapse on me. I thought of the kitties, and then the monks and then my good friend who also lives in the centro. But there was nothing to do but hope I didn’t die. No damage visible in the house. A few things fell off the shelves and the pictures were askew. The power was still on and a glance out the window told me it was still going throughout the valley. I started calling people, but realized at that moment that my phone was out of credit. Couldn’t even send a text. I decided to get dressed and go down to town to see if there was anything I could do. To see if everyone was OK. And maybe pray with the monks. While I was dressing we had our first big aftershock. All I could do was wait it out, while the house rocked back and forth and the roar, like the world collapsing, grew and then faded. By the time I was ready at quarter to four, I heard cars and motorini already heading down the hill to town. I got on my bike at ten to four and everyone was up along my street. People were in their gardens and congregated in clutches along the roads, frightened faces shining white in the street lights. There was already a traffic jam to get into the city at the Porta Romana, and that was where I saw the first damage. The stone of the arch was sound, but a lot of the plaster was on the ground in pieces. The plaster and stucco of many of the buildings showed large cracks, and a few facing stones were in the street. I’ve since learned that sections of the wall on the north side have come down and are in the road. There is a large crack down one of the medieval defensive towers. The facades of some of the churches are cracked. I’ll have a walk around town later to see for myself. But generally, the older the house, the better it held up. My friend’s house in town, where I’m using her wifi, was built originally as a monastery in the 15th century and there’s not a single crack anywhere, and only a few broken glasses on the floor. Houses built in the 20th and 21st centuries range from visibly damaged to uninhabitable. The piazza was full of a couple hundred people, milling about, some with blankets around their shoulders, many with their dogs. Some older people were in wheel chairs and some of the hotel guests had their luggage piled up around them. The monks were all there, all present and accounted for. The joke was immediately made, “So, this is what it takes to get Hilary up in time for Matins!” Hilarious, guys. About seven am. Most of the crowd dispersed, monks (and me) singing Laudes in the crypt. Photo: Michele Sanvico, via Facebook. I parked my bike in the piazza this morning, and not in its usual spot between the wall of the Basilica and the monks’ shop. Didn’t want any rocks to fall on it. In fact, quite a lot of the ceiling plaster is on the floor too. Our ceiling is undecorated, so no art was destroyed, and all the paintings on canvas seem fine, but there’s going to be a job of work to tidy up and I’m sure we’ve lost a lot of the decorations. We’re just hoping that the restoration work on the side altars is OK. The scaffolding covering three of them is still up and looks solid. The gathering in the piazza had an odd air. No one was quite sure if there would be another big quake, and we milled around, chatting and making weak jokes. I was sitting on the steps of the town hall when the roar came again. People were screaming with fright as the piazza, normally very reliable and solid stone, suddenly turned into a surface more like a trampoline. We clustered in the centre of the piazza as we watched the cross and the statues on the facade of the Basilica, looming far above our heads, wave back and forth like flags. The five am tremor was the last of the big ones, though (so far) and we started to get reports from the internet on iPhones about other towns. 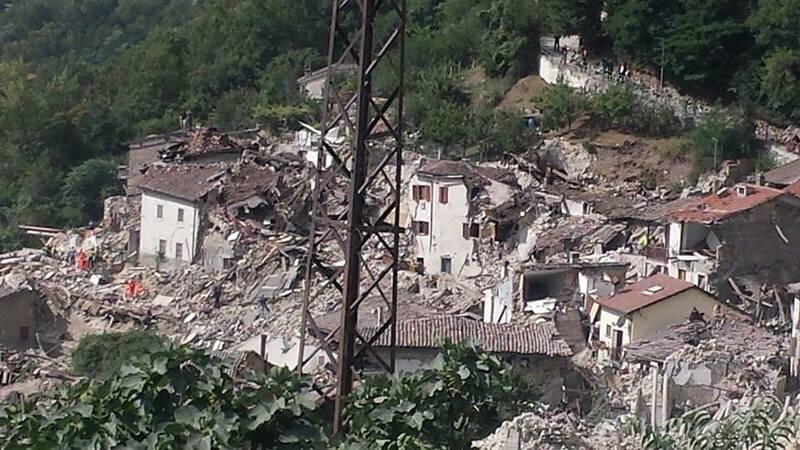 The towns of Amatrice and Accumoli were the worst, with most of these towns flattened, people dead and missing, shouts heard from under piles of rubble. The latest count from Amatrice (at eleven am) is 22 dead. This is a mountainous region, with what few roads there are often winding through steep valleys with high, rocky peaks all around, so steep that in winter whole sections remain in constant shadow. The highways often drive right through the mountains and rock falls are common in winter. We have already seen photos of some of the tunnels partially collapsed. Reports have come in that emergency vehicles are having a hard time getting up to some of the smaller, more remote hill towns. Not many people still live in them, but those who do are nearly all elderly people. As we started seeing reports of people killed – Amatrice just reported 22 dead and the town “no longer there” – we decided it was time to pray. The early hours of morning before dawn are cold, and the monks were in their hoods. Many of the local people and hotel guests had blankets wrapped around them. We all stood in a large circle as Fr. Cassian, seated on the steps at the base of St. Benedict’s statue, started the prayers in Latin. A number of people joined us, young and old. A girl about seventeen was standing next to me, wrapped up in a blanket under her boyfriend’s arm. Both were praying the old Latin prayers. All knelt and received the blessing after we sang the Salve Regina through another aftershock. Some people from the city arrived in a truck and put out chairs. The hotel people came around with blankets. The chief of the Carabinieri arrived in his civies, the mayor was there with his wife. I helped hand around some pastries and fruit. We were asked to stay out of the buildings until at least 15 minutes after the last aftershock. It’s nearly 11:30 and we’re still getting them. While it was still dark, but the sky was lightening, the monks and friends went to the shop to have something to eat and figure out where we were going to have Laudes. The painted plaster in the ceiling was cracked and much of it was on the floor. A few bottles were broken and we swept up the glass. Someone brought out bananas, pears, cornetti and coffee. We stood around talking and joking. It’s a funny thing that though we were scared, and with fairly good reason, the mood was cheerful. The first big tremor was over, and we didn’t think there would be another really big shake. We were mostly thinking about all that needed to be done to clean up and get life started again. Fr. Cassian led the way down to the crypt church – the family home of Sts. Benedict and Scolastica – that has a sturdy vaulted ceiling and has withstood earthquakes since the 2nd century BC. It was an experience I’ll not soon forget, singing the Divine Office, Laudes for the Feast of St. Bartholomew in that ancient place, the monks voices strong and deep, resonating off the stone. Not one beat was skipped as another large aftershock shook us during the Benedictus. No one even glanced up. Afterwards, I got a call from Vatican Radio, a friend who works in the English section wanted “local colour” for their story. I might post it if I can find it and if I don’t sound like too much of an idiot. People are still pretty jumpy. Each aftershock, coming every ten or fifteen minutes, is incredibly unsettling. But the mood in town is still very cheerful. We are aware that other places near by weren’t so lucky and there are people here who have gone off to help with trucks and winches and digging equipment. Meanwhile, I was glad to run into friends in the piazza who told me that all their family are fine – including their dozen-odd pets – but that their house was un-livable. They have a kind of family compound outside town in the country, right at the base of the mountain; mum and dad in one house, brother and sister-in-law in the next, and the two of them in the third. There’s lots of work to be done to fix things up. But this is Italy, and everyone knows we have earthquakes here. People will help each other, they’ll sweep and tidy, and help to rebuild. They’ll take each other in and make meals and look after the kids while the grownups work. It’s always been this way. It always will be this way. Thank God. Glad you survived to write and pray another day. Others were not so fortunate. Let us use this event as an opportunity to meditate on life and it’s endings and ask God to inspire us to appropriate action. 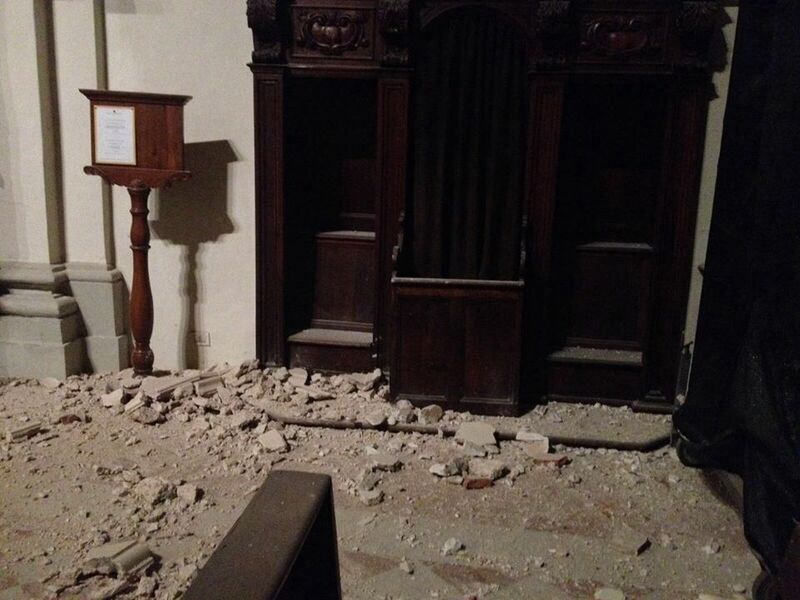 Do you think this earthquake may help Italians reconsider what happens at the end of this life and thus return to the traditional Catholic Faith? Unfortunately the many earthquakes in Christchurch, New Zealand seem to have had no spiritual aftershocks whatsoever. Praying for you all. God bless and keep you. Here in California with my Trad friends spread at least 45 min to an hour away. 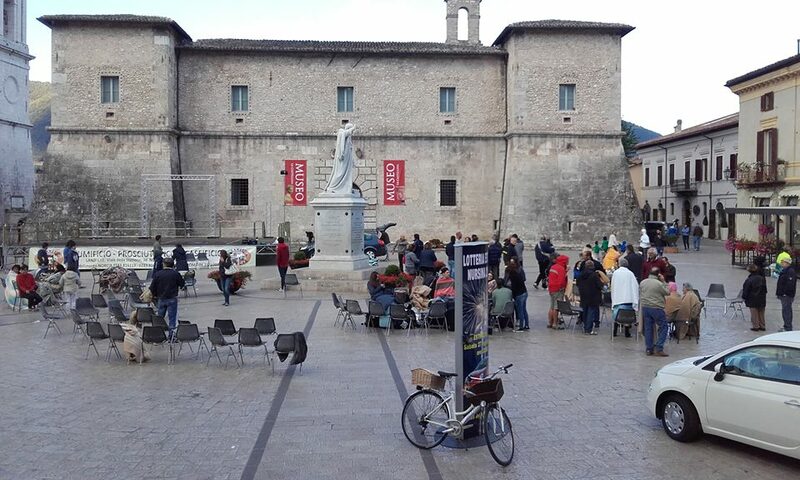 I couldn’t help but feel a tad envious of so many like minded prayer warriors near by gathering in the Piazza to pray. Circling the wagons, you might say. How blessed you are to be surrounded by such a beautiful community. Hard to believe but there are devout prayerful souls here in California behind enemy lines. Hilary, I thought of you and the monks immediately upon reading about the quake. And prayed for all of you, as well as the poor victims there and other places. I am so happy that you and others are safe! Thank you for your account of events. God bless you all, and protect you. When I heard about the earthquake earlier, my first thought was, “I hope Hilary is OK!” Thank God you and all in Norcia are fine. And what better place to be in the midst of disaster than surrounded by holy monks. Thank God you and the monks are unscathed. Looks like seismic activity may be slowly ramping up on both sides of the equator. We have friends in Christchurch, New Zealand who suffered a 7.1 in 2010, a 6.3 in 2011 and a 5.9 earlier this year. Ironically, they left South Africa for a “safer” home in Christchurch, New Zealand! You were the very first person I thought of and prayed for when I saw the news. I’m glad you are safe and that repairs are underway. You’re right — the noise is the scariest part and does conjure up thoughts of ICBMs and doomsday scenarios. The earthquake comes almost as a relief in comparison to what the brain sketches out in those early moments. Thank you for your excellent recap of your experience. It’s funny, I only found you when you put this site up and only through your written words, but the moment I realized where the earthquake was I went to the maps and started praying. I am so happy for you that you have found the friendships you have, which include the incredible monks and their prayerful singing. Praying the rosary for Umbria. Thanks for the report. I’m glad you’re all alright. I knew they make a lot of noise, but I’ve never experienced or even imagined anything like that. And to be woken from a sound sleep by it was something I’ll not soon forget. The steel rods that hold up new buildings have the added effect of magnifying the vibrations, making it more likely, rather than less, the house will be damaged or fall. But plenty of old medieval stone houses did come down in all the towns around us. It is difficult to escape the thought that we have been miraculously spared. Since Norcia had so little damage and has so many residential properties available, I expect there will be another population boom here. Norcia is the biggest town in this area, and many, many people around the three regions of Umbria, Marche and Lazio, as well as further east towards the sea, have relatives and many friends here. The population in this part of Italy is quite low, so people tend to know each other a great deal, and there are still strong connections. What the New Rite, so called, makes of him is entirely irrelevant. God bless you. Thanks for this. Heard the news last night before going to bed and immediately rummaged through the map inserts from old National Geographics to find out how close Norcia is to Amatrice. That didn’t bring good news especially since you hadn’t posted anything. So very glad to read that you’re relatively unscathed. But Norcia and the monastery . . . .
You’re prayed for here, too. I can believe the older buildings may have less damage. I recall being in Italy and seeing the iron supports on many of them just for this reason: to survive an earthquake. But the news looks dim for the towns hardest hit and the suffering will be intense. I was very glad to see you were ok, Hilary. I’m very sorry for all the loss of life in the area. That’s quite a piece of writing, especially under pressure. You have missed your calling – war correspondent – or perhaps your new career/vocation has just been launched!! Blessings on all souls during this ordeal! Thank you for the update. Wish I could be there to help with the clean-up. 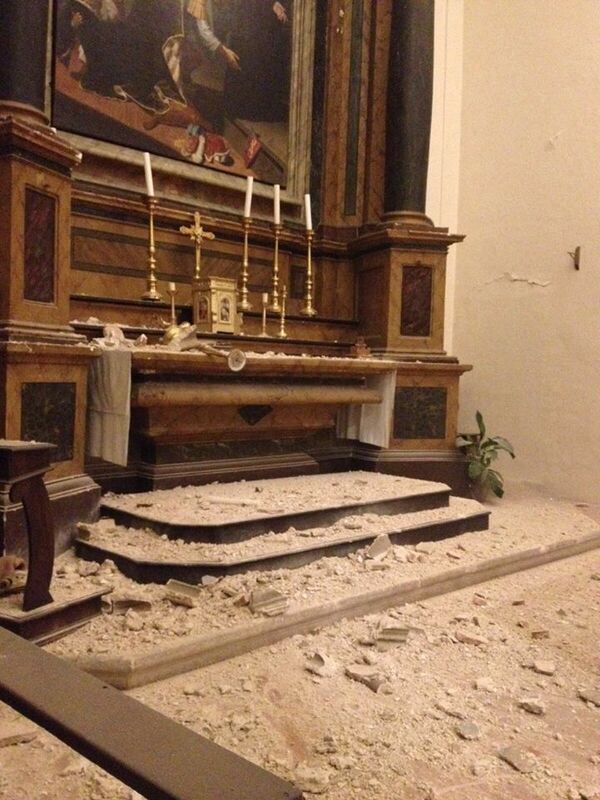 When they said the quake was centered near Norcia, I thought about you the monks. God be merciful to those who have died. I am just a reader from SW Florida who loves your writing, your strong spirit and your brutally honest (it’s needed! ), sometimes hilarious and always insightful, essays. Glad you’re still with us! Hilary, thank you so much for keeping us posted! When I heard of the earthquake, I immediately thought of the monastery and looked for news — and was led to your site through One Peter Five. Please keep us posted. I enjoyed reading your account. Thank you. My son and I were in Assisi last year and now we order beer from Norcia so I was concerned about the monks and the monastery. I have a question for you. You said the crypt church was there from the 2nd century BC. Was it a church then? Pagan or Jewish or was it used for some other reason. I find the history very interesting. I hope it’s not correct, that death count being so high. Hilary. So glad you’re okay, and the Monks, and many of the townspeople. Keeping prayers going and keeping tuned in. I read on this Reuters report that the death toll is now at 73. Gosh. Thankful to hear you and the people in your community are safe. So much destruction and so many others who are suffering heartache today. Prayers for all the people hurt/killed by this earthquake. God bless you and keep you safe. Thank God you’re all right, and it sounds as if most people you know are also ok. Being from Southern California, I know what you’re going through. The aftershocks should diminish in magnitude and frequency, but there could be clusters of them even after a few days. I don’t know how familiar you are with earthquakes, but a strong series of earthquakes is something I’ve never been able to get used to, especially the rumble/roar that precedes them. Continued prayers for you all, not only in Norcia but in the other towns, and especially prayers for the dead. Thank you for this Hilary. God bless you. I”m glad to hear you are ok, and the monastery, and brothers. Thanks for posting this morning, I was wondering about you and your town and hoping for the best. Any damage to the Domus Santa Marta at the Vatican? Happy you are OK, Hilary!! May The Lord keep you in His hands. The TV is showing devastation in nearby towns. Lord have mercy.. Sigh. My mother thinks it better to stay out of the way with what’s going on—we’ll do another night in Spoleto and take a ‘wait and see’ about coming out there. Now to buy a spaghetti amatriciana and pray unceasingly for Umbria. Glad to hear you are OK! The Matins joke was pretty clutch given the situation…..kudos to the monks! I think it’s all closed right now. The tunnels are damaged. Don’t know. Sorry for spelling your name incorrectly, Hilary. Still a bit fuzzy this early in the morning. Woke up at 4 a.m. here in Ohio and turned the news on to hear of the earthquake. My first thought was,”I hope Hillary is all right.” Thanks be to God and Our Lady that you and your fellow townspeople are safe. May Our Lady protect you all. Lord have mercy! That’s what the august and ancient services of the Church are for. Parce Domine! I have the Grotta Azzurra booked on Saturday night. I’m heading south with my mother and I really wanted to make a stop, pray, have some strozzapreti, and show my mother Norcia. Hilary, have you heard anything about the road from Spoleto? Very glad to hear that you and yours were spared! Yes, I’m so glad you’re OK. I prayed for you, the monks, and all the locals when I first heard about the quake. Continued prayers for all of you in the days ahead. Glory to God for all things. I am glad you are unscathed, and that the monks and the townspeople are ok. I liked your comparison of the piazza being as stable as a trampoline. Probably as unsettling as when one is about to faint; but in an earthquake you are very much alert, yet almost completely helpless because everything around is unstable and shifting. Well, the world has had plenty of practice since Vatican II, except that the continuing aftershocks have been stronger the last three years and the physical destruction and damage continues. Perhaps it will stimulate us to bear more abundant fruits. I do hope so. God bless. So glad you’re OK. Got up this morning and heard about the earthquake on Breaking News. They said it was centered on Amatrice. Looked it up on Google maps and then had to search for Norcia. When I saw how close they were, I knew you must have felt it. Glad you posted!!! When I saw 6.2 (I was over at Orwell’s Picnic), I didn’t understand, I thought that was the date of your last post. Stupid me you meant a 6.2 earthquake. Hilary, you’re in my prayers. I haven’t read the entire blog post but it looks as if the monastery took a hit. The monks are in my prayers as well. Keep us posted, if you can. Please take care of yourself, you are probably going to be having after shocks from the earthquake. Please take precautions at your flat. Wow, Hilary, what news from Norcia. Thank God you and your friends are okay. Thanks be to God you are fine Hilary. My first thought was of you when I first read about this at 1:30 am in Canada. I will pray for you and all in the region especially the dead, injured and the rescue workers. St. Benedict ora pro nobis.